For those who like to have everything straight and centered you will love this template for your resume. All of your details are aligned straight down the middle of the page. Prominently displayed, you will find your name on the first line in a larger, bold typeface. The addresses you enter next are positioned one after another each on their own line. Your contact addresses, etc. are clearly defined and easily found. Beyond that are the section labels which are also in a larger, bold typeface. They have full width horizontal rules below them marking the beginning of your important data. The labels for your job titles and degrees are center aligned. The details for these jobs and schools have the names positioned to the left and the dates are positioned to the right. Important, targeted facts that are specific to your upcoming job application are written into bulleted lists as is normally done on a resume. Remember that your references are generally not put on the resume itself. This only takes up unnecessary space and goes against that, which is considered proper protocol. If you like you can choose to have the customary "References Available Upon Request" line at the bottom. Then, you can create a separate page for your references, we have a creator specifically designed to help you do just that. Don't forget your cover letter you will need that too. When filling out your job application the company will normally request the information they need from you. Follow the protocols as instructed by their Human Resources department. 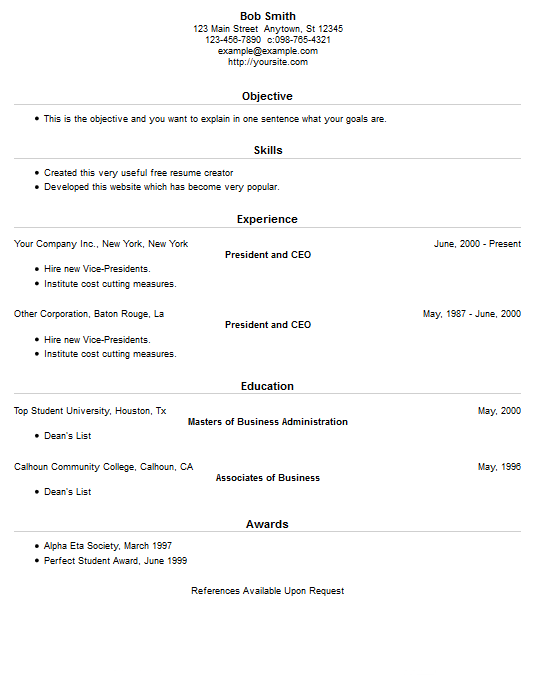 This and many other templates each with different styles and features can be exported from our resume creator.